Mickey 8's Story . . . I want to thank MASSER for the opportunity to foster Mickey over the past 14 months. It is the hard work, dedication and policies of the MAESSR family that allows wonderful stories like hers. She came into the rescue in very bad shape but left this world knowing she was dearly loved and not allowed to suffer but die with dignity. While many folks are hopeful that Old Man Winter is packing his bags, Mickey has enjoyed his visit. This girl loves the snow, and cold weather actually seems to energize her. With her Canine Vestibular Syndrome a thing of the past, she could truly enjoy adventures in the snow on much steadier feet. Mickey’s urine leakage began to increase so some additional doses of her medication has been recommended to see if that helps control her bladder. This month Mickey has informed her dad that she much prefers eating wet dog food and chunks of hot dog. He deems it a reasonable request and is happy to accommodate her with this change in menu. Because she tends to get herself worked up in the car on road trips, Mickey won’t be attending any of the MAESSR picnics this year. But, quiet time at home is her pleasure these days. Mickey’s dad proclaims her to be a wonderful old girl. She’s such a love and enjoys herself to the fullest each day, which brings a smile to his face. It’s certain that he brings a smile to her face too…as does wet food and hot dogs! Mickey is easing through her golden years with calm, comfort, and individualized attention. She’s doing reasonably well for her age. She is recovering from a case of Canine Vestibular Syndrome and it causes her to be unsteady on her feet. She still does reasonably well, even with a few extra dogs spending some time at her foster house for the holidays. 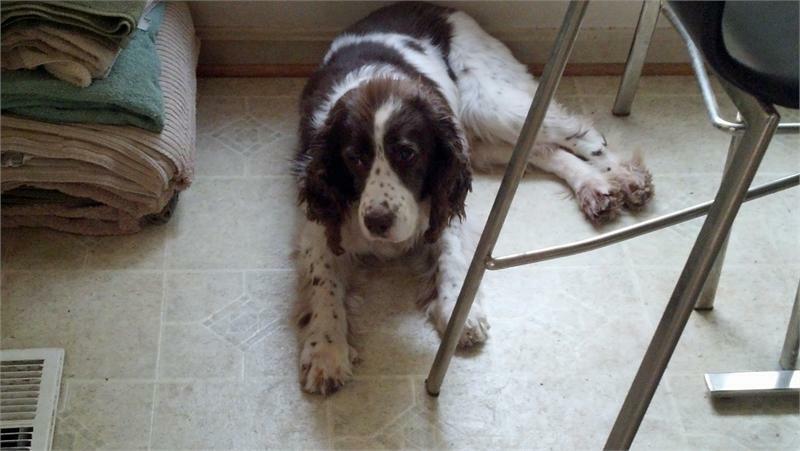 Her foster family is grateful for every day she is feeling good and hopes it continues for a while…as are all who love senior Springers. Sending the best of wishes to Mickey and her family as they begin 2015 together! Mickey is SO happy that the cooler weather is back. She just loves to sit on the back deck, presiding over all as the queen of her domain. Fall is a more comfortable time of year for her because her summer hot spots are now healing up nicely and she is feeling so much better! Her ears continue to need daily cleaning but she likes the treat afterward; she tolerates this interruption in her otherwise peaceful day. Mickey had a nice steak for her 14th birthday and she was very grateful for that special acknowledgement! She loves her bones and bully sticks but has stopped eating hard food for dinner. Her dad devises special menu creations made just for her……the smellier the better! Although Mickey is slowing down a bit and her naps are longer and deeper, seeing her little stub of a tail wiggle when she is happy is the best part of her dad’s day!!! May she and her dad have many more sweet days together! Update 08/26/2014: :“Mickey is very happy that the weather has been much cooler in the mornings, allowing her to do her favorite thing and hang out more in the backyard." Uh, oh. Just when one enjoys one’s food and gains a bit of weight, the diet police get involved. And so life goes with Mickey. She’s gained another four pounds, so she is being given less food at each meal. But, since this beautiful senior really doesn’t like the hot weather, hopefully, her activity level will pick up again with the fall and winter months and that will help her maintain her weight. Mickey continues to do well. She is very happy that the weather has been much cooler in the mornings, allowing her to do her favorite thing and hang out more in the backyard. She has battled some allergies and hot spots but some helpful sprays are making her feel much better. Her right ear still needs daily cleaning, but she does not scratch as much as she did. Update 06/25/2014: “Summertime....and the living is easy for this wonderful seasoned Springer!!" MAESSR’s lovely senior citizen is finding that she prefers snowmen to sun showers; the summer heat and high humidity are not fun for her, so Mickey spends a lot more time inside and knows where the air conditioning vents are located. She can usually be found cooling herself by one of them! Mickey’s ears still need to be cleaned on a daily basis to keep her comfortable. While she is not the biggest fan of the routine, she does like the cookie she gets after for being a good girl. This beauty and her family didn’t go to any of the early season MAESSR picnics, but she does still like to go on early morning store runs when the temperatures are cool enough. Summertime….and the living is easy for this wonderful seasoned Springer!! Update 04/24/2014: “Mickey has gained 5 pounds since coming to her foster home, thanks to the roasted chicken she is served at every meal." Miss Mickey continues to be such a wonderful house guest.........she knows when she has it good! Mickey has gained 5 pounds since coming to her foster home, thanks to the roasted chicken she is served at every meal. Her ears require daily cleaning; she really doesn’t like that, but is happy to feel so much more comfortable. Mickey continues to patrol the backyard with zeal, and, with the warmer weather, she has found a nice spot to sit and survey the street, watching for any person or truck that dares to come past HER fence. Do you think she’s checking to make sure that scary snowman doesn’t come back? MAESSR’s senior lady is indeed a lucky girl. She has yummy people food added to her bowl, a place in the sun, a wonderful family to call her own.........and it’s almost summertime! Mickey is doing wonderfully in her foster home, which is now her FOREVER HOME! Based on Mickey’s age and how well she adjusted to the routine of her foster home, it was decided best not to put her through the adoption process and have her adjust all over again in a new home. She loves her home and her family loves Mickey! She gets her latest ear checkup soon and it is hoped that this visit will pronounce her infection-free. Now that her ears are feeling much better she has regained her hearing…….but that’s not to say she doesn’t try to ACT like she can’t hear when she’s not ready to come inside! Seeing her cute little tail wag when she is called for dinner is enough to make her dad’s heart melt after all she has been through. Her incontinence medication continues to control her urine leakage and her bottom continues to be dry almost all the time. 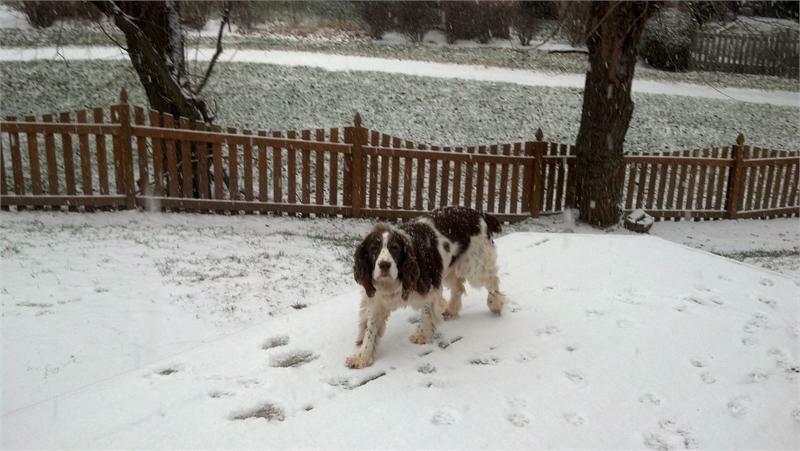 The winter weather has been fierce this year and Mickey and all of her canine siblings have been busy with the snow. If you’ve checked out the MAESSR Facebook page, you’ll see that they made sure a scary snowman knew he was not welcome in their yard! 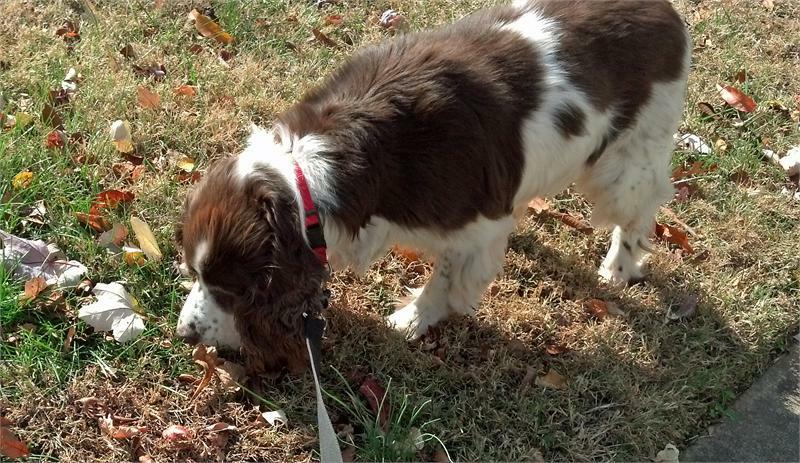 Mickey is one of the wonderful MAESSR success stories for senior Springers. She is living her golden years in a home where she is loved and given the necessary medical care that all seniors deserve. What a wonderful, happy ending for Mickey and her family! Update 01/21/2014: “What a love this gal is, and how much her foster family enjoys her company!" Mickey is 2 weeks into a 3-week routine of daily medicated drops for her ears, and, right now, they seem to be working. This senior is so smart her family can’t tell if she is regaining some of her hearing or is reacting quickly to the other dogs’ cues. She’ll visit the vet again for a check soon. MAESSR’s beautiful lady is also taking two types of pills for her incontinence and they seem to be working fine. Her foster dad thinks she is now dry 99% of the time……go, Mickey!! While the rest of us may be moaning about snowfall and cold weather, Mickey is in her element. She is the last to come back into the house as she is just too busy making snow angels and enjoying the fresh breeze. She continues to be the “queen” when she feels like it. At other times she’s comfortable with hanging out on her bed for a snooze while the younger Springers act their age…..:)). What a love this gal is, and how much her foster family enjoys her company!! Watch for more information as her treatments are finished and Mickey helps to build snowmen instead of snow angels! Mickey has really settled into her foster home and loves her routine. With good healthcare, she’s close to being in tip-top shape. Mickey had been having a problem with some urine leakage. She’s now taking medication that has helped tremendously. The hotspots on her skin have cleared up, which just leaves her ear infections as the last hurdle. She’s currently undergoing another round of medication and eardrops; hopefully they will help her ears feel better soon. Moving like a much younger dog, Mickey loves to patrol the backyard at her foster home. She’s quick to yell at all of the big, nasty delivery trucks that drive past. There sure are a lot of deliveries in December! 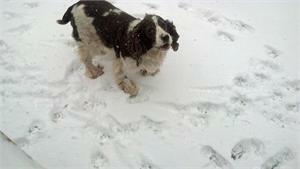 Mickey is a sweet, young-at-heart Springer senior. She would love to share her golden years with a family of her own. Consider opening your heart and home to Mickey. Mickey is a 13 year old beauty that was dropped off at a shelter in Maryland . The shelter staff knew that this senior girl would not get a home through them and contacted MAESSR for assistance. Fortunately for Mickey, she quickly found herself in MAESSR’s care. Now living with six other dogs in her foster home, Mickey gets along great with everyone! She loves to be around people, too, and has been around children as young as six years old. Weighing in at just 43 pounds, Mickey is very mobile for her age. While she has been diagnosed with a heart murmur, this condition requires merely occasional observation. Because she arrived at her foster home with severely infected ears, she is receiving daily treatment to clear them up. She’s not a big fan of ear cleaning and the medicated ear drops, but Mickey does not resist her daily regimen. It appears that lifelong ear problems have left her deaf. Although she initially had some urine leakage, testing found Mickey had a urinary tract infection for which she is now receiving medication. Vets at the shelter thought she had some urinary incontinence and had started her on meds for that. Her foster family’s vet will monitor her after her UTI is over to see if the incontinence medication should be continued. Mickey is a trustworthy girl, and is allowed free run of the house. She would be considered housetrained if it weren’t for her bouts of incontinence, but that should be alleviated by the antibiotics she is receiving for her UTI . The poor girl does not even realize when she’s had an accident; it is certainly not intentional on her part. While she might be moved to beg for a piece of food, this sweetie has otherwise great house manners. Taking walks or riding in the car are great pleasures for Mickey and she does well with both types of outings. During a ride in the car, this silly girl rubs her backside up and down on the car seat. Perhaps it’s just the perfect thing to scratch that otherwise unreachable itch! Seasoned Springers are the best! Just ask Mickey’s foster dad, who declares her to be a wonderful girl. Consider adding sweet Mickey to your family during this holiday season.